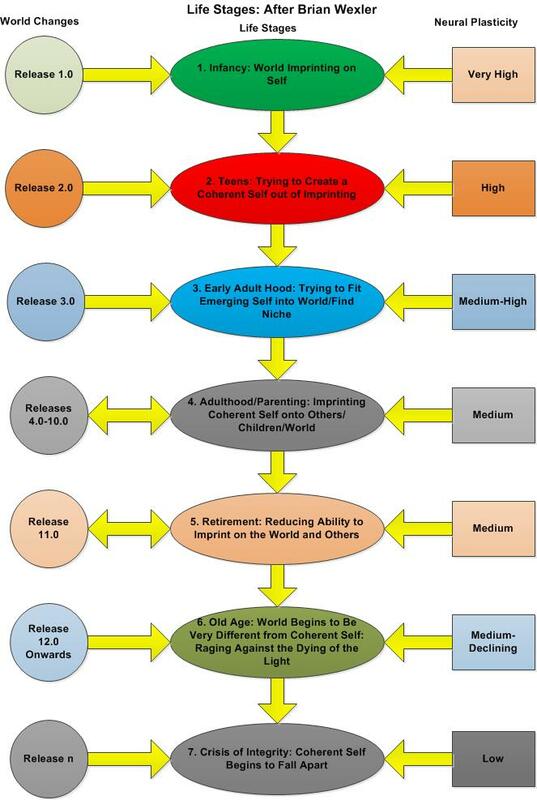 I was doing some work on life stages, using the insights of Brian Wexler’s fine book Brain and Culture, and dreamed up this diagram that captures seven life stages in the context of a rapidly changing world what I represent as producing continual new releases of reality and our inner neural plasticity that declines with age. I guess the message of this growing conflict and dissonance between the changing world and our ability to mentally adapt to it is not to rage against the dying of the light but to keep in touch with the changing world, seek to understand it mindfully without too much judgment and thus feed our neural plasticity. Not easy but may reduce the pain of ageing somewhat. This entry was posted in Conflict Book Reviews, Conflict Processes, Marital and Relationship Conflict, PERSONAL CONFLICT RESOLUTION: CREATIVE STRATEGIES, Ways to handle conflict and tagged ageing, Brian Wexler, changing world, Life Stages, neural plasticity. Bookmark the permalink.